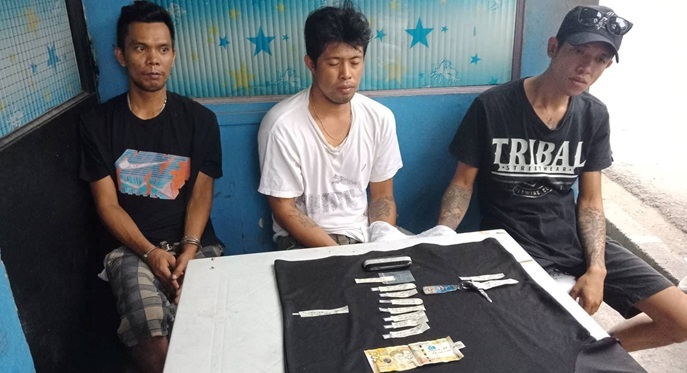 Two alleged drug dealers were arrested together with one of their suspected buyers in an anti-drug operation in Tagbilaran City on Saturday afternoon. Police identified the arrested men as Ramil Lubay, 30, Reynaldo Gonato, 33, and their alleged buyer as Nortier Alo, 28. According to Supt. Patricio Degay, chief of the Tagbilaran City Police Station, both Lubay and Gonato surrendered under Oplan Tokhang. Personnel of the Tagbilaran City police intelligence section allegedly spotted Lubay and Gonato selling shabu along Belderol Street in Barangay Cogon. Operatives then subjected both men to a drug buy-bust operation wherein an undercover cop was able to buy from them P500 worth of shabu. The alleged drug dealers together with Alo who was with them during the operation were rounded up by police.